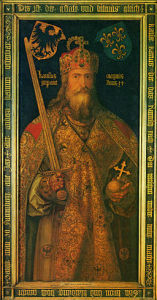 Everybody’s heard of Charlemagne but many of us have no idea why his name has endured through history. Today is Charlemagne’s birthday, so here are some talking points to grow your brain and impress your friends. 2. He is known as the “Father of Europe” because he united western Europe, essentially conquering what we know as France, Germany, and Italy. 3. His empire is known as the Carolingian Empire, though it only existed from the year 800 to 888. 4. Through his adult life he had four wives and five concubines. Not surprisingly, he had boatloads of children. 5. He was tall, estimated to be six-foot three-inches in a time period when the average man would be in the mid five-foot range. This probably helped him become such an effective leader.